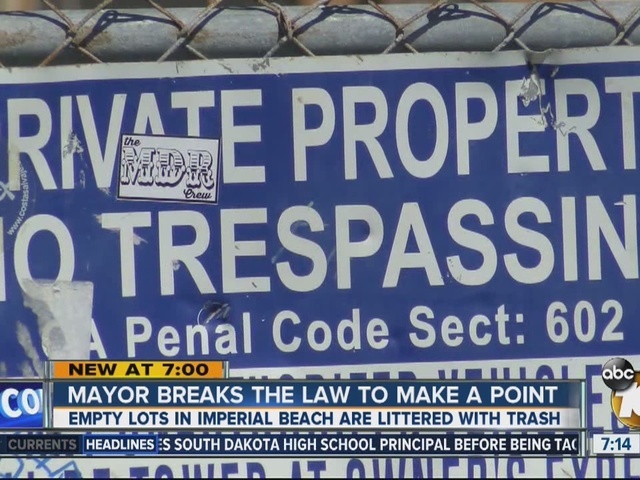 Imperial Beach's mayor, city manager and assistant city manager of Imperial Beach broke the law Wednesday morning in order to prove a point. Mayor Serge Dedina and others in the small group trespassed on private property, going over a fence onto a lot on Seacoast Drive. "We got a bunch of drunks that throw their garbage in an empty lot," said Dedina, who filed a complaint with his own city. "If we wait for the government to take action to do it, it'll never happen." "You are the government though?" asked 10News reporter Joe Little, who apparently also trespassed on private property during his report. "We are the government, but the official process, whatever notifications it takes for the slumlord to get the news that his lot is filled with vodka bottles, takes too long," Dedina replied. Dedina, City Manager Andy Hall and Assistant City Manager Steve Bush picked up liquor bottles, broken glass, cigarette packages and other large pieces of trash. "All the slumlords, we're declaring war on blight," said Dedina, who wanted Imperial Beach residents to follow his lead. "Just take the initiative and clean it up themselves; don't wait to file a complaint, don't wait to get the government involved," said Dedina.